Fuller Brush Company has recently introduced a new line of cleaning products and brushes. 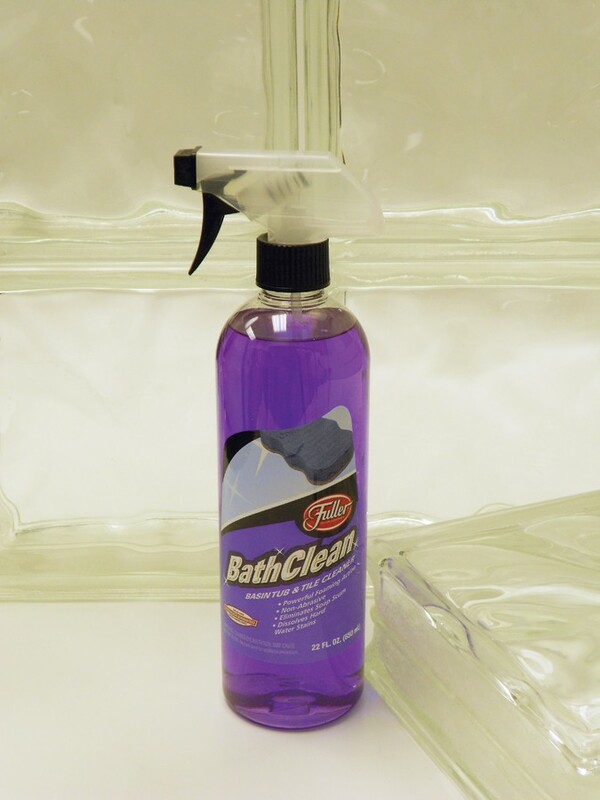 I had a chance to review their Bath Clean-basin tub and tile cleaner and really loved the performance of it.I sprayed it in my tub and allowed it to foam and then rinsed cleaned.And clean it did. I could rinse clean without any scrubbing! I loved the smell too! Some cleaner that go deep to clean tubs can really smell bad, but this one, even Gerry said, left the bathroom smelling fresh. Fuller Brush continues to make almost all of its products in the USA, 95% are made in their manufacturing plant in Kansas. They have products for every household need and many eco-friendly—long before others went eco-friendly. The Fuller Brush Company has grown from one man's fiber suitcase, filled with unique custom-made brushes, to an exciting collection of home/business cleaning, and personal care products. I remember hearing about Fuller Brush Company when I was even a kid. Make it work. Make it last. Guarantee it no matter what. Visit their web site for great cleaning tips and suggestions on how to handle your household cleaning problems. Fuller Brush Company would love to give away a prize pack to one lucky winner from the USA. A random draw will be made by Random.org on December 12, 2011 from all entries received. Tell me if you have used Fuller's products in the past or present. If so, what is your favorite. I have never used their products, but as a Kansan, I support local businesses. kj_paine at yahoo dot com. I've never used Fullers products, but I'm curious about the Foaming Barbecue Grill Cleaner. Cleaning the grill has to be one of the toughest things I have to clean! I have never used fuller brush products but would love to try them! I can never figure out how to enter these things! I can remember a Fuller Brush sales person from when I was really young. I am now 58-I did not know they were still in business. My mom and grandmom loved them-good products for a reasonable cost! !After 50 years, give or take a couple, I don't know what is my favorite-but I would love to try something to clean my 100 year old tub. It is a dirt magnet! I liked the part of your review about not scrubbing-so this would be my new favorite!!! I did the Google Friend Connect thing and see my absolutely gorgeous icon!!LOL! I do subscribe to your emails! I've never tried Fuller products but am always looking for that perfect cleaner. I have never used Fuller Brush Co products! I have never used their products. I have never heard of this product, so I have never tried it! Sounds great though!